The idea of Santa Clause is exciting. I personally love going to bed on Christmas Eve to an empty stocking, to waking up to its’ overstuff-edness (It’s the 21st century and completely clausible to make up words…ehhhh ehhmmm plausible). It is fun to think that a mysterious gift giving Santa man, with the help of pointy eared, joyous worker elves created and crafted toys and treasuries all year long to be placed in a sock in millions of children’s homes, on a most looked forward to night of wonder. Call me crazy, but for some years believing in this came easy. My mom told me that when I found out that good ole Santa Clause was a FAKE, I cried and cried. Hysteric with emotion I shouted out “if you lied to me about Santa how am I to know if Jesus is real?” I remember waking up on Christmas mornings, after that fateful Christmas day, trying to conjure up the hope again, that just maybe it could have been Santa who placed my sled under the tree, and I could become blinded to those three words MADE IN CHINA. 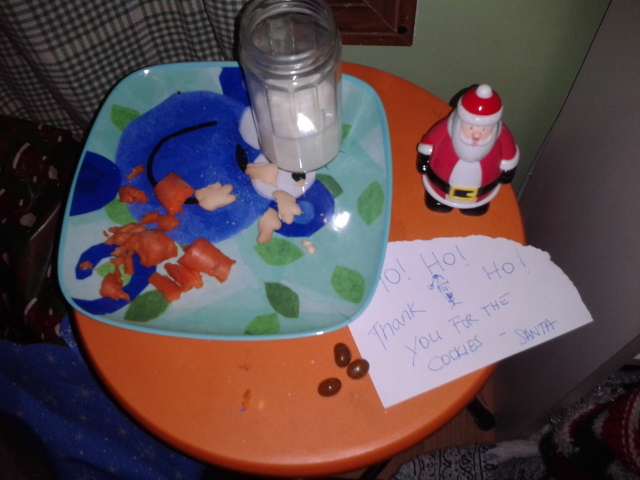 My younger brother still believed in this fraudulous Clause, so I pretended, year after year, to be astonished when the cookies were dramatically left half eaten, the milk glass was more than half way empty, or that the reindeer really did poop on our living room floor. I’m 28, it’s been 20 or so years since my child like faith in Santa Clause and Jesus Christ was put to the test. Today facts and faith have led me to still uphold my belief in the virgin birth, as far as Santa, it’s a tradition I have willingly decided to tolerate, with reservations. Beliefs aside, it is the holidays, of which one is Christmas Day, a holiday by which I celebrate the birth of Jesus Christ, Wonderful Counselor, Mighty God, Everlasting Father, Prince of Peace. So, on that note, Merry Christmas.